Who doesn’t love a spot of baking? It’s fun, therapeutic and the best bit – eating the baked goods when they are ready! 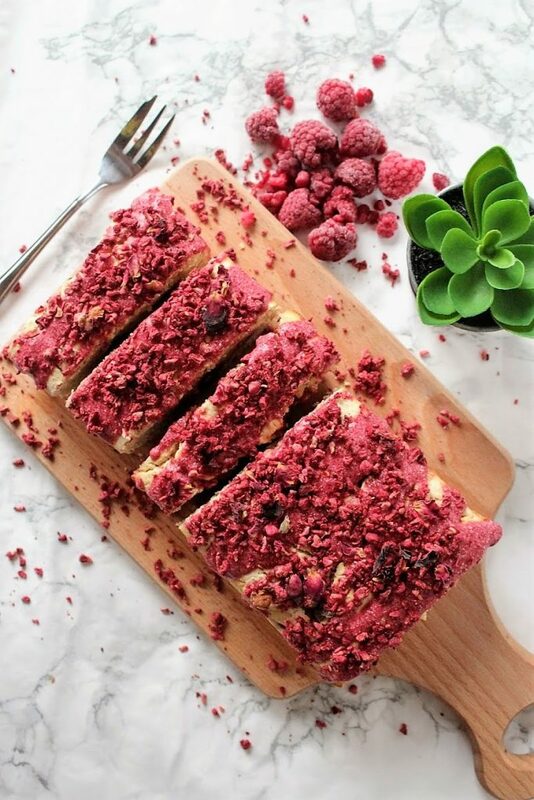 Whether you’re fully vegan or doing Veganuary for a challenge, baking may seem a bit daunting or uncertain if you’re not sure about what ingredients or alternatives to use compared to traditional baking. That’s a huge part of my job – working out healthy and free-from ways to bake while still creating a delicious treat! 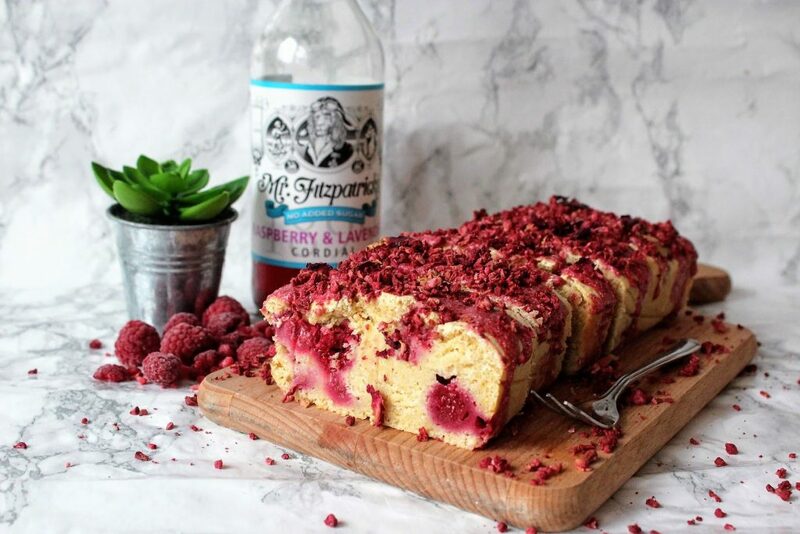 This loaf uses aquafaba aka chickpea brine which has been catapulted to fame as a way of making a vegan meringue by whisking it – how the hell did someone find that out??!! But it also works well in a cake/loaf/muffin batter mixture to lighten it up and create a fluffy, spongy texture which I love. 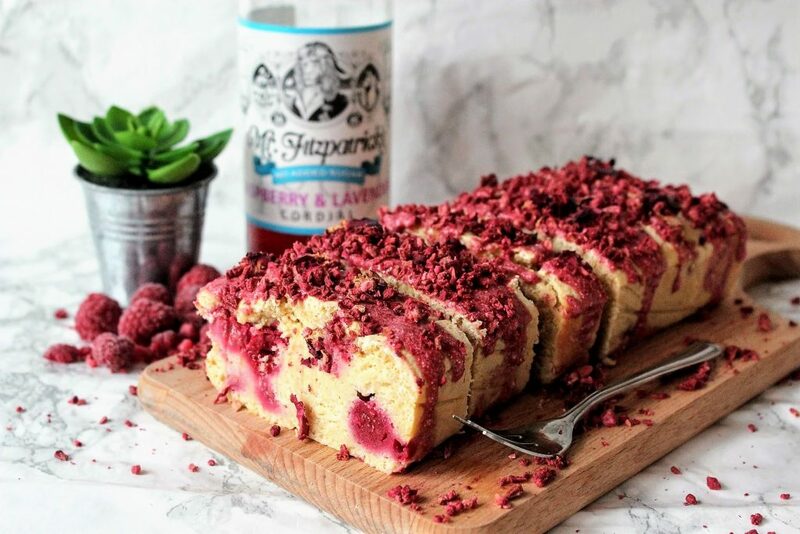 With a combination of raspberries, coconut, apples and the best bit – Mr Fitzpatrick’s Vintage Cordials Raspberry & Lavender no added sugar cordial – this makes a gorgeous, tasty bake to enjoy at any time of day, for any occasion! Mix together the flours, coconut sugar, baking powder and bicarb in a bowl. Whisk together the apple puree, chickpea brine (aquafaba), almond milk, cordial and vanilla until frothy. Pour this into the dry ingredients and stir well to combine. Fold in the raspberries gently. Spoon into the tin and smooth out evenly. Bake for 35-40 minutes until firmed up and golden. Leave to cool then pop out of the tin and onto a wire rack. 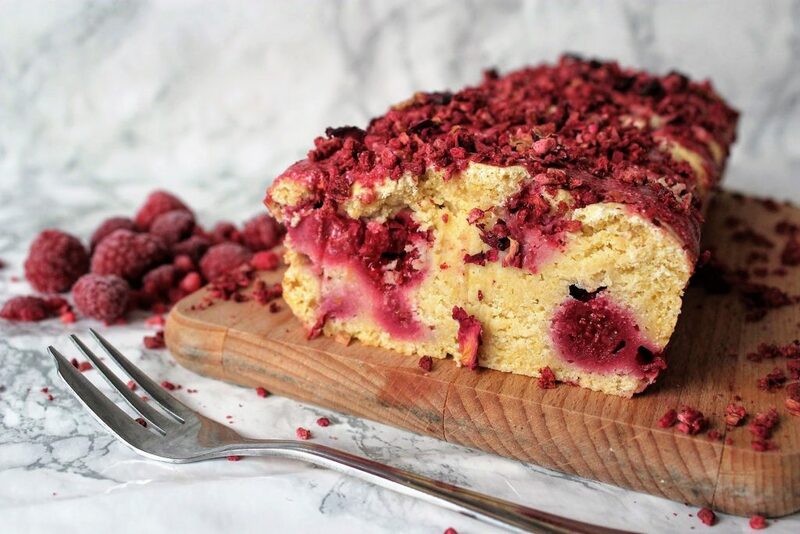 Whisk together the coconut milk powder, raspberry powder, water and maple syrup until you have a slightly runny consistency. 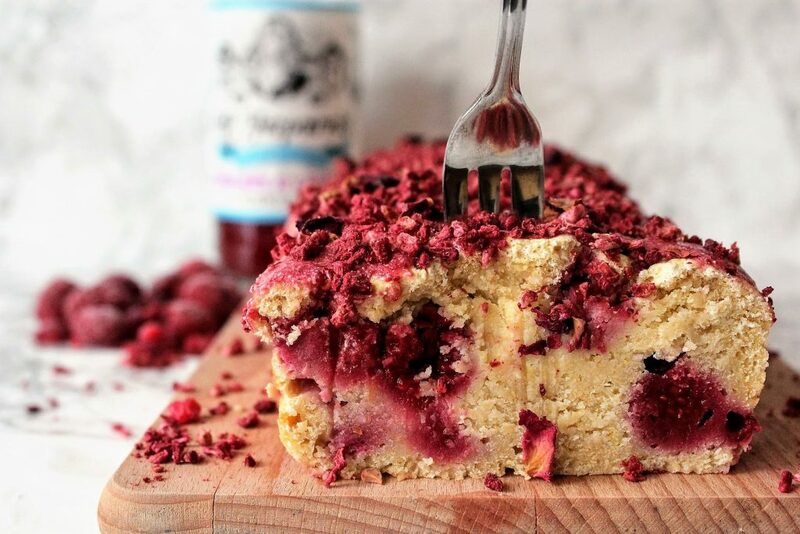 Drizzle this over the loaf then sprinkle over the freeze-dried raspberries and rose petals. Slice and enjoy!